Everyday can be a struggle when you feel that fear has a hold of you. Fear to move on. Fear to love. Fear of the unknown. When your a child, that fear doesn’t exist. You trust without a thought. You love with no regret. You believe that you can do anything. So, when does that fear become an emotion that grasps on so tight that it becomes difficult to move, to breath, or to hold on to reality? Human nature makes us believe that everything is black or white, good or bad, but sometimes there is a grey area that gets forgotten about when people’s actions can be carried by the emotion of fear. Fear can lead to regret, heartbreak, and resentment. Why do we allow this emotion to control our actions? Why can’t our mind go back to our childhood and block out that four letter word? Society connects with stories about the underdog. The person that was never meant to make it because of one thing or another. Is anyone truly an underdog, or do we create these immortal men and women hoping to hold on to something that is better than our own lives? The people that are important in our lives make us believe that the impossible is possible, but no matter how many people believe in you means nothing if you don’t believe in yourself. When fear takes hold, you can feel stuck. Almost like no matter which why you go, what action you make, you are going to fall through that crack in the floor and not be able to recover. I just wanna’ play my part, should I make waves or not? The best songs that we connect with are about emotions that we feel everyday and fear is just one of many, but I feel that it can be the strongest one of all to either make us fight or fall in this world. Everything you want, desire, and need is on the other side of that fear; so let it go. Sometimes the best you can do is take it one day at a time and get up each morning to Eminem’s “Not Afraid” because no matter how alone you feel, your not. Three things you can never recover in life – the word after it is said, the moment after it is missed, and the time after it is gone. We dwell on missed opportunities, on the choices we’ve made, and on the emotions we feel everyday like over-thinking our actions is going to change what we would have done. Thomas Edison said, “Time is really the only capital that any human being has, and the only thing he can’t afford to lose.” Each minute that passes by is another minute lost when we could have been productive, could have been spending it with someone we love, could have been doing something to affect change. Four minutes can feel like an eternity, or it can feel like the speed of light. Many songs that we encounter in our lifetime are less than four minutes. It can change our mood, it can make us recall a memory, or it can be a moment in time where we stop and question a thought, emotion, or an action. So what’s in a song that makes our brains turn upside down? Is it the music? The lyrics? A combination of the two? Why do we gravitate towards certain music genres and not others? As a music lover I love listening to everything – from Rap to Bubblegum pop, but this post is more about the lyrics of the songs that I have chosen in this playlist. They are all poem-like where there seems to be a deeper meaning behind each one. Some are tied to movies, some can give you the strength to begin again the next day, and some make you feel like there is someone out there that is meant to be your other half. Running makes you think a lot when you are not gasping for air trying to get to the next block. During each song on my playlist I have learn to fall into the music instead of fighting against my own body and totally giving up; pushing to the next street. Four minutes can change everything – meeting someone that connects with you beyond your looks, losing someone that meant everything to you, or closing your eyes and imagining that life can be a better place with just a little bit of understanding. A four minute song can bring you closer to understand all the emotions that happen inside. The ones that you are not ready to talk to about with anyone; not even the ones closest to. These words can make you feel better even if it is just a good cry that you never knew you needed. “Your time is limited, so don’t waste it living someone else’s life. Don’t be trapped by dogma – which is loving with the results of other people’s thinking. Don’t let the noise of other opinions drown out your own inner voice. And most important, have the courage to follow your heart and intuition. They somehow already know what you truly want to become. Everything else is secondary” (Steve Jobs). Emotions are a funny thing. They make us act before truly thinking and sometimes that can be a good thing because it doesn’t allow us to over-think. Fall into the music and let it carry your thought process even if it is for only four minutes. When I was kid, my younger brother and I would be singing in the back seat of the car to whatever song was on the radio which usually consisted of Chicago, Queen, Styx, or the Eagles. My brother and I were partial to the Eagles, more specifically the song “Heartache Tonight,” but we changed the words to “a party tonight.” I remember my mother trying to correct us and you guessed it, we continued to ignore her and proceeded to sing the lyrics wrong. Eagles, I sincerely apologize for our lack of consideration to your songwriting skills, but we felt we had a better version. We were wrong. Heartache Tonight was written by Glenn Frey, Don Henley, Bob Seger, and J.D. Souther. The track is included on the Eagles’s album “The Long Run” and released as a single in 1979. It reached number one on the Billboard Hot 100 in November of that same year and the single sold one million copies. In 1980, the band received a Grammy Award for Best Rock Performance by a Duo or Group Vocal for the song that gave us the lyrics “Everybody wants to take a little chance, Make it come out right.” Heartache Tonight will hold a special place in my life as it was a song that helped bond my younger brother and I as two goofy kids in the car who instead of fighting for once, we actually agreed on something. I pretty much want to recite this line to everyone I encounter in the general population. So, Mr. Henley, know that you are not the only person who is frustrated about people blaming their circumstances and problems on everyone else instead of looking in the mirror. The Eagles were the band that began my music obsession as I pretty much stole all the Eagles CDs (among others) my parents had and kept them in my room. There, I proceeded to keep them in my stereo once in high school, and ultimately copied them to my hard drive and iTunes library so I could play songs like “Life In The Fast Line,” “Get Over It,” and “Hotel California” during my daily workouts. Hearing about Glenn Frey’s passing was devastating as I felt a music superman had left this crazy world a little quieter without his guitar strumming, music writing, and passion. The world is a little darker without you, but thank you for the memories. I’m sure you have heard about 5 Seconds of Summer’s new album, the new single by Ariana Grande, and are waiting patiently for the next Justin Bieber album. 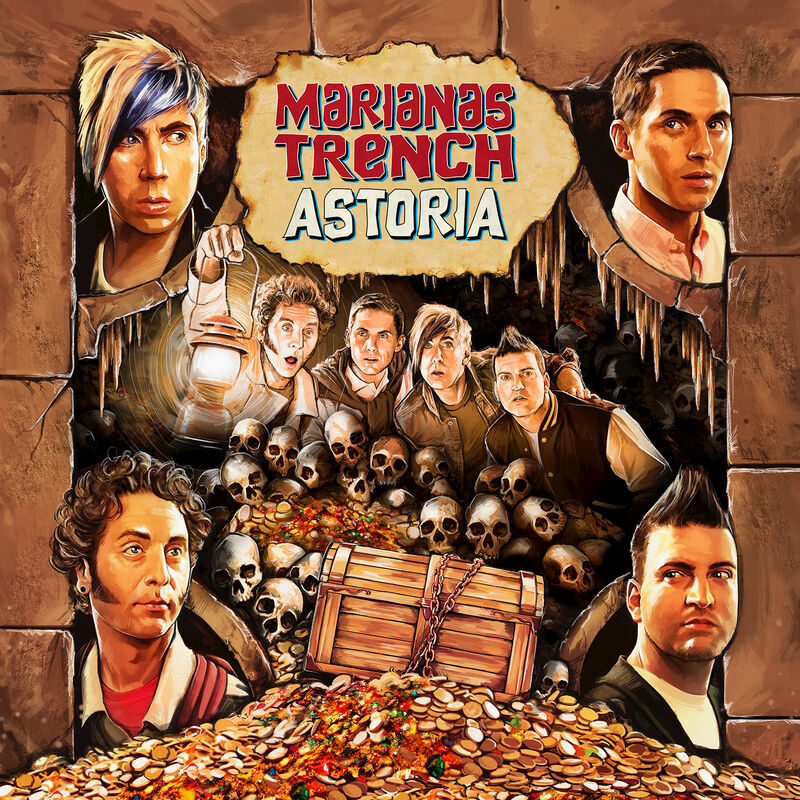 During all of that, Marianas Trench has yet again slipped under the radar with their fourth studio album Astoria. Josh Ramsay, Matt Webb, Mike Ayley, and Ian Casselman bring a mix of the decades with the deep baritone voices and harmonies of the 50s, the swinging beat of the 70s, and the modern sounds of today’s pop, combined with a little 80s soundboard mixing. The album brings the listener through a 17-track storyline of an adventure of love, loss, and an end of a life chapter. The storyline theme is roped in their last two albums, Masterpiece Theatre and Ever After. In this album it seems to be an end of an era. They combined elements like the shortened instrumental sections connecting the major tracks like in Masterpiece Theatre, and lyrics that reflect songs from Ever After. He brings back the Jackson 5 style in “Shut Up and Kiss Me” through lyrical repetition and iconic opening instrumental of a piano key swipe like in Jackson 5’s “I Want You Back”, which he mimics with strings. The emotion in Ramsay’s voice is full of energy, youth, and honesty as a chorus of singers lend in harmonies inspired by the original soul brothers of the Jacksons. Check out their new album here!